There’s quite a bit of concern in Gurnard about a beach that’s access has been blocked by a newly constructed fence. OnTheWight has been pulling the pieces together to better understand it. OnTheWight has a photo of the closed access to a beach in Gurnard, that has been blocked by a fence with a Isle of Wight council logo-ed sign declaring ‘Access Closed’. Residents in the area have been concerned about not being able to reach the beach, which is a favorite to walk along by locals. 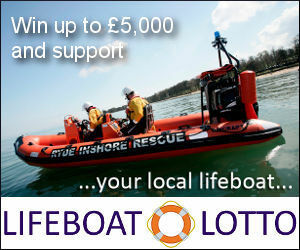 OnTheWight got in touch with the IWC and the local councillor, Paul Fuller to find out more. The whole of process started when a member of the public reported that they had slipped … on the slipway. Paul tells us that he was first made aware of this when IWC told him on 10th January, after the barrier had been put up, blocking access to the beach. Below are the details in the respective party’s words. Previously a wooden structure was privately installed on the beach at the end of Shore Path. The location of this facility sits on land the council manages for the Crown under a Regulating Lease. In October 2018 an accident occurred whereby a member of the public slipped when attempting to use this facility. This was reported to the council and followed up with an inspection. The outcome has resulted in the structure being deemed unsafe to use. We did attempt to locate the owner but unfortunately we’ve been unsuccessful. Even though the upkeep and maintenance responsibilities are not the Isle of Wight Council’s, we do have a duty to persons wanting to go on the beach via this route. We are not in a financial position to undertake any repairs and would not do so on structures that do not belong to this Authority. However, in order to ensure public safety and to keep costs at a minimum we installed fencing to stop access. Unless of course the owner of the slipway comes forward and undertakes the necessary repairs and maintenance to ensure that it is safe to use, the council has no intentions of removing the fencing. Closure therefore is indefinite at this stage. Happily the local Isle of Wight Councillor, Paul Fuller, has more information. I was advised of the closure following a barrier being put in place on 10th January. Following this incident, the IW Council has attempted to find an owner of the slipway which was constructed by Harry Spencer during the 1980’s. From my perspective it is very plausible that like the sea wall for Shore Path and the path that connects the beach to the Green in Worsley Road via what is an old rubbish tip(!) is without a formal owner. Harry built the slipway etc. because he was community spirited and supported residents having access improved and maintained. Although there is access to the public, no formal public right of way exists within the Copse itself and to Shore Path at present. I have suggested this becomes part of the Gurnard section of the English Coastal Path when adopted. This will ensure future access and liabilities are safeguarded under legislation next year. Please note that the IW Council only has a role insofar as they manage the access to the beach on behalf of the Crown Estate, who are responsible for the beach below mean high tide. Therefore, if a person makes a complaint to the Council about a slipway being dangerous, legally the Council would then be considered to be ‘negligent’ and liable if another incident occurred following the first complaint. Although, I share your frustration on this it should be remembered that if claims of negligence are made against the IW Council, it is local taxpayers who shoulder the cost. With respect to signage instead of a physical barrier, the IW Council has advised me that this would be insufficient to mitigate against claims. That said, with the information that has been fed back to me, I am looking at options to get the access reinstated, sooner rather than later, although, I have been advised that the slipway is in a very poor structural condition and options for a short term solution might be limited. What is of concern to me is that I know that residents will attempt to access the beach by accepted private slipways which are also considered dangerous to be and problematic to the residents who have liability over Shore Path. In the meantime, I would welcome any ideas of suggestions coming forward to reinstate this important access for residents. 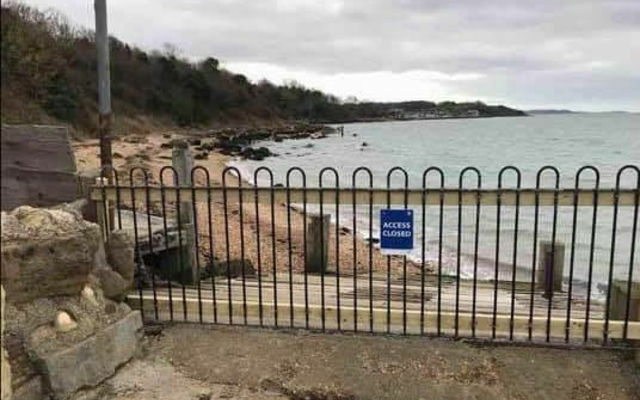 3 Comments on "Closure of Gurnard beach by council ‘indefinite’, unless …"
Latest news: The barrier has since been taken down and re-positioned to allow beach access along the walkway and thence to the beach….good news. The re-positioning has been done to currently block access down the slipway.